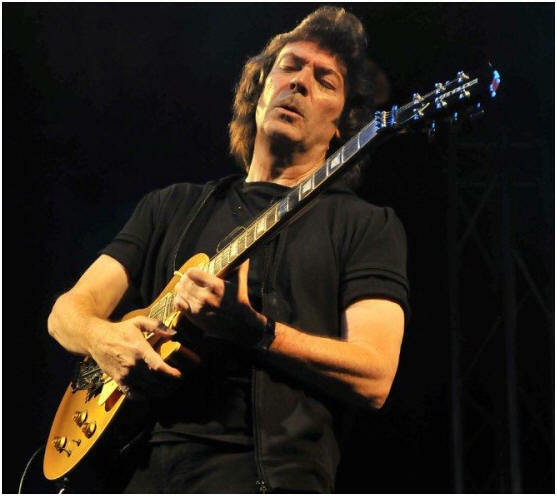 We have a new interview with Friars legend Steve Hackett who is looking forward to coming back to Friars as much as we are looking forward to seeing him back. Steve's history with Friars goes back to 1971 when he witnessed Peter Gabriel breaking his ankle jumping into the crowd at the Borough Assembly Hall. Here he talks about Friars and of course about the new Genesis Revisited album which you will hear at Friars on May 9th played by the master himself. 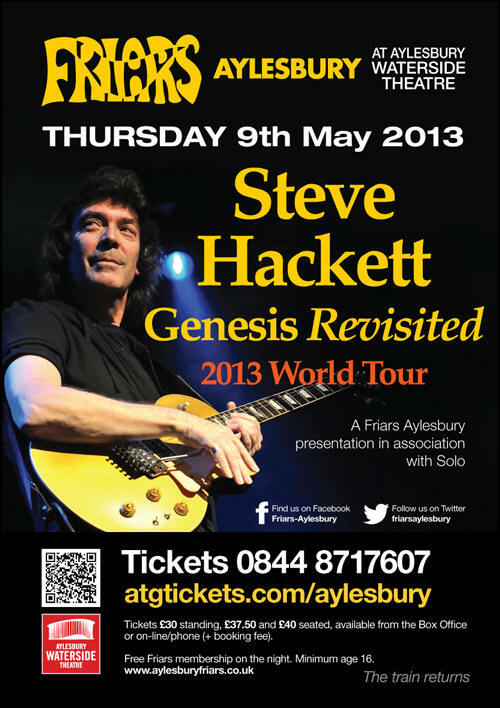 Steve is currently in extensive rehearsals for the tour in March 2013 and we are very grateful for him breaking away to talk to us. The Genesis Revisited 2 album is available now. Steve, welcome back to the Friars Aylesbury website and welcome back to Friars Aylesbury! How have the rehearsals been going? They're going great and the band sounds wonderful. Rehearsals repeatedly going over the same stuff, up to nine hours a day, so I'll be taking the weekend off to recover! We are so looking forward and so excited at you coming 'home' on May 9th. I'm really looking forward to it too. I have lots of good memories of Aylesbury, playing many times of course. It felt like home, it was the sure-fire gig that was always going to work for us and it was such a great feeling, those first gigs that Genesis did as a band where there was such an acceptance. David (Stopps) very much believed in you. Yes, there was a level of success implicit in that, a feeling of completion before it happened if you know what I mean. Of course we had a long way to go, a long way to travel and a lot of rough edges to polish. But there was a sense of Friars being ahead of the rest of the world. A lot of bands have said that if Aylesbury took to you, there was a fair chance it could go national. Exactly. That's important. I was saddened when Friars closed and delighted when it re-opened. That was jumping off the stage wasn't it? People didn't realise it wasn't part of the show, he was sitting on the floor saying "why didn't anyone come to help me?" (!) Eventually, it was Richard MacPhail who was mixing up front who realised there was a problem.......you can't rehearse moments like that! I guess with his stage persona, him being rooted to the spot was never going to work! No. We did about three gigs with him in a wheelchair. I remember one gig in Durham where he was waving his crutches around in the air being as equally dangerous as if he was running around the stage! I should imagine it was dangerous to you whilst you were playing, avoiding flying crutches! Couldn't imagine being whacked during a complicated guitar solo! You had to adopt the mantra of wherever the stage was your home, then you're in for the long haul and whatever can go wrong will go wrong at some points. Things can go imperceptibly wrong, I've been on a stage that caught fire.....we've all been on stage where we've fallen over and I don't know anyone who hasn't! The law of averages catches up with you in the end even if it's just a broken drumstick. A broken Mellotron is another problem though....but I've been at this now since 1971. You are just about to go on a world tour including as we mentioned Aylesbury, with the UK dates selling well, performing Genesis Revisited 2. Listening to this album, you've obviously approached this in an entirely different way to Genesis Revisited 1 in the sense that the arrangements seem to have been made with a conscious eye on performing them live. Whilst I think the arrangements on GR2 are very fresh sounding, it's clear that you haven't gone down some of the experimental roads you did on GR1? I had the idea of doing live concerts and I thought the best way was to re-record some of the old songs as an absolute reference point because I have to say that just the 12 string parts that Genesis did were not "straight" - we often had three people playing different chords and we had to accept deliberate musical disagreement to get that third or even fourth chord to work musically and that was what it was all about. To reference those things, you start from scratch with a blueprint laid down so you can play it live and also I wanted to add some orchestral parts to some it too. It was also difficult to follow this vocally when you consider the originals were Peter Gabriel and Phil Collins who went on, rightly so, to be big stars. The idea of safety in numbers by having an array of singers was the way to go. Different singers, including myself, taking different parts at different points. I felt justified going back to that, the early arrangements, as I was advertising the fact that when I joined the band it was as a songwriters collective and if you wrote guitar parts, then you were considered to be a fully fledged writer of the songs. During Gabriel's tenure, it was very much a collective and after he left, it was different and became competitive so that ethos no longer applied. So I was coming up with parts which I laboured long over and with love and care and they weren't being used. So part of the guitar part I am now playing live on Ripples for example, that shows it moving forward as well as a backward sound. When you come up with parts that are difficult to pull off......I am proud that we incorporated nylon guitar into the Genesis sound. I do that now. I wouldn't trust holding back on technique and virtuoso work for the sake of it. The music comes first but it's a given that you have to have technique to pull some of these things off. Some other bands don't do it this way - the statement doesn't come first, the punctuation becomes king and you can end up with something half arsed. It's like the difference between Bach and other composers. There's melody running through it and many people refer to him as the first jazz musician. I'll come back to Bach later...when we last spoke about GR1, you said you would have approached it differently now because of better technology, presumably GR2 was easier to record, but why was now the right time to revisit some of your old Genesis catalogue? The feeling was....I've seen so many of the Genesis tribute bands, who have been good. The music is the star. Most of those tribute bands want to try to re-interpret that earlier material that made people take up drums etc. Several of these bands were very good and a journalist has told me that there are 50 tribute bands worldwide performing that early Genesis material. I was a part of that which was not considered necessarily to be a success (at the time). It was almost as if Genesis with Charisma Records was a bit of a "problem child" as we didn't fit the mould. Latterly, there seems to an investment in something people can't quite define. I felt these songs had been my life life long companions and have acted as the standard in my own mind many times (in terms of solo work) and I have thought is this something Genesis would have done, would it have got through the 'committee'? It was a tough school and difficult to please at times. But I learned what makes a melody swing or what makes a piece of music work sonically and so many other ways of defining what is good. Many people have said that musicians start off with passion and end up with technique. I would like to think you can combine the two to subordinate technique to have that passion. 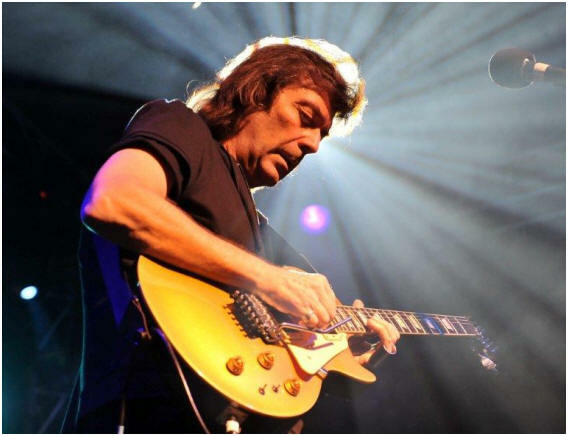 And there's no greater passion for me as a guitarist that a well executed piece rather than the blazing runs that so many guitarist try to do. I explore and spend time still practising scales, but there are decisions you make that ultimately define you as a musician. There's a very good argument for spontaneous music, spirit over form. On the other hand if you were having a conversation with Tschaikovsky today, you'd like to think he'd say "interesting chord sequence there!" We're likely to look to the classics or jazz - on the periphery of rock there are always these influences. To move forwards you always have to look back I think. Given you hadn’t probably played some of these songs for many years, how difficult was it getting back into the swing of them? Initially it felt daunting because the music is really complicated and there was a lot to re-learn after so many years. However, once I had gotten back into it all, the spirit kicked in and my fingers began to fly. The band members have all got a great feel for this music too and it now feels as if there was no gap in time... the songs and riffs are all flowing and speaking back to me. With the tribute bands, I understand the reasons (for them), but you've every right and reason to revisit these, you were there in the first place. It must have been difficult with GR2, it must have been such a difficult choice as to what to select? From a Genesis fan point of view I think you've spoiled us with some extra nuggets in there such as Shadow of The Hierophant which was never recorded by Genesis but you had rehearsed it around the Foxtrot period. We rehearsed the ending of that song during the Foxtrot period. I felt it deserved it to be on a Genesis album and when I recorded it three years down the line (on Voyage of the Acolyte, my first solo album), there was a consensus that we should have done this as a Genesis song. I am personally delighted that you have many tracks from the Wind and Wuthering album on GR2 which was a great collection overall, but whilst there is only so much you can do, were you tempted to revisit Inside and Out? That's an interesting tune and an interesting work out musically. I think the extra compression on that brought the song alive. If anything it could have developed towards the end which is why I think it didn't make it on to the final cut of the album. I think it's very strong, we did play it live on the Wind and Wuthering tour in 1977 and it worked well. The other two tracks left over from the Wind and Wuthering sessions, "Match of the Day" and "Pigeons" which with "Inside and Out" made up the Spot the Pigeon EP, much as I love them, showed a light hearted side of Genesis. In terms of humorous songs, there are moments which have been hilarious but musical jokes tend not to be classic. I would agree. Some people love those tracks so I am not going to cast aspersion on their choices but I think it was one of the stronger tunes. But there's all sorts of reasons at the time as to why certain songs are chosen. We often had an excess of material but I like to think we made the right choices most of the time. But there are moments where you think gems shouldn't be forgotten. We were famous for writing tunes which got left on the back burner and came back years later. Also around that time and which also features on GR2 is Please Don't Touch which you intended as a Genesis song and you certainly rehearsed it for the Wind and Wuthering album. I know you were to record this on your next solo album, but it must have been frustrating when you have to get these through the band committee? When he heard my version, Phil Collins said that he didn't remember it being that strong in the rehearsal room. At the end of the end of the day not every band, not even the greatest bands, can do every song complete justice. I think GR2 is a very well balanced album. In terms of a huge body of work and what you choose must be difficult to get that good balance. You have to make some brutal choices. There were other things I could have done but these were the strongest songs and the most beloved by fans and I had to make sure that not only were these songs loved by fans but were still loved by me I have to make sure from a guitarist's point of view, there's something musical, something idiosyncratic and some quirky about it. One of the appealing things is that you haven't gone for the obvious (and not revisited stuff that you already did on GR1) and included Genesis relevant material such as Hierophant and Camino Royale that weren't necessarily recorded by the band first time round. They are as harmonically developed as the Genesis tunes. Whether Genesis would have interpreted that way if they had recorded them.....but we had a wealth of musical ideas which is what made the band strong but even with a double album like this, it's extremely long and it's extremely comprehensive and you'd be pushing the envelope to try to add another tune. I couldn't stretch it to a three CD box set and there were time constraints too. We started in January 2012 and finished in August. There were so many personnel to co-ordinate that teams were working on this concurrently. Eventually two or three people coordinated it, there's 35 performers on there. A cast of thousands! Pleased to see Aylesbury's own Steve Rothery on there too. You've obviously chosen who you work with musically and vocally. You've a wide range of vocalists including Nik Kershaw and Simon Collins (Phil's son), whilst I know it's Amanda Lehmann, when I first heard Ripples on GR2, I honestly thought (without realising then who the vocalist was) that it was Stevie Nicks. Yes, she does have those sorts of qualities in her voice. The man out on tour with you as guest vocalist is Nad Sylvan who is featured on the GR2 album. He's done rehearsals with us this week and sounds fantastic. I'm on record as saying I am the most flexible member of Genesis and had they said they just wanted me to do one walk on (like Milton Keynes 1982), I would have yes, anywhere, anytime. But you need everyone working together. I think there was insufficient common ground to try to work out a way forward. But everyone's become bandleaders in their own right and celebrated as much as individuals as they are in the band. We wrote these songs together and certainly up to 1975 we were the most democratic band you'd ever find. I gave my all to the band and I feel I am giving my all to the idea of what became Genesis now. I guess songs that stay in the affection for that long.....the only comparisons I can make are the worlds of classical music, jazz and musical theatre where the songs survive. 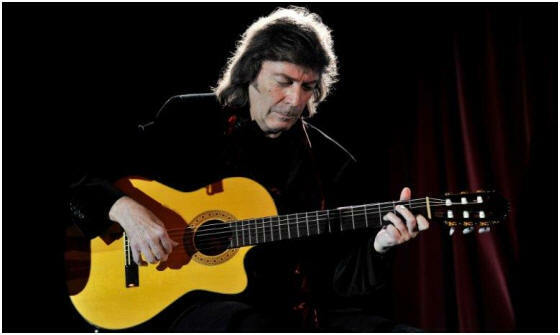 I said I'd come back to Bach....in 2008 you released the astonishing Tribute album, where you interpreted Bach's pieces on classical guitar. A real labour of love and it reminds me that you remain the only artist ever at Friars to encore with a classical guitar piece.....technically it's an amazing album. Although GR1 and GR2 are some years apart, would you consider a GR3? I don't think the material warrants it bar a massive reinterpretation and you'd be heading far down the classical route which may stretch credibility in terms of what is and what isn't Genesis in relation to what would be my version of it. So we've the GR2 tour coming up, it's a big production this tour isn't it? Can't tell you enough how much we're looking forward to seeing you on May 9th! Thank you for your time and good luck with the rehearsals and the tour. I'm very much looking forward to it too. Please send my best wishes to everyone at Friars Aylesbury and to David and Joe Stopps. This interview and its content are © 2013 Mike O'Connor/www.aylesburyfriars.co.uk and may not be used in whole or in part without permission.